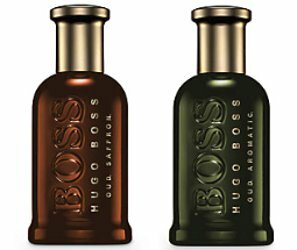 Hugo Boss has launched Boss Bottled Oud Saffron and Boss Bottled Oud Aromatic, two new woody fragrances for men. Boss Bottled Oud Saffron and Boss Bottled Oud Aromatic are limited edition flankers to 2015's Boss Bottled Oud, which was a flanker to 1998's Boss Bottled. Boss Bottled Oud Saffron ~ "Boss Bottled Oud Saffron is a spicy take on the classic Bottled Oud. Elegant and sophisticated notes of saffron and rose are wrapped into comforting labdanum resin. The base notes of precious oud woods give the fragrance its pure magnetism, for a sumptuous and sensual scent." Boss Bottled Oud Aromatic ~ "Boss Bottled Oud Aromatic is a luscious take on the classic Bottled Oud. With its orange flower note on top and seductive myrrh at heart, it is both seductive and comforting." Boss Bottled Oud Saffron and Boss Bottled Oud Aromatic are available now at John Lewis in the UK, in 100 ml Eau de Parfum.